Forest Hill's Dartmouth Arms offers a varied choice of drinks alongside a food menu of classic pub fare. Do you work at Dartmouth Arms? What did you think of Dartmouth Arms? 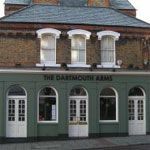 You might not expect it on a busy main road in Forest Hill, but walk into the Dartmouth Arms and you’ll walk straight into what feels like a welcoming living room. Chesterfield sofas, hot Havana rum toddies, low music and the smell of dinner cooking in the back room keep the mix of local old boys and south east yuppies firmly in their long-stay seats. Nestled between a hairdressers and a post office, you might think the Dartmouth Arms is going to be your average boozer - but it’s not. When the door is closed and the main road is left behind, it’s full of surprises. Dark wood floors, low hung lighting and snug seating are revealed in the friendly and warm bar area. Hidden at the back is a dining area that is so much of a secret, you don’t even realise it’s there if you’re having drinks in the front section. Settle yourself in for a relaxed, lazy, long Sunday afternoon with a group of friends, a board game and drinks, or a Dulwich-priced roast (£11.50). When the lights turn down, chatter flows over low lit tables. It’s usually bustling on weekend evenings with a definite need to book for food. It’s less frantic in the day but the smiley bar staff still go the extra mile and bring the drinks to the table. The menu at the Dartmouth Arms is delightfully experimental and seasonally changing, with fancy sausage casseroles, whole baked cheeses, authentic Italian treats and Shetland mussels among the regulars. They boast produce from Borough Market, Billingsgate fish and Oxfordshire meat and are very proud of their twice cooked chips which are a must-try, as are the arancini rice balls. Not everything quite hits the mark, however, and the occasional dish is pretty average, especially considering the height of the bill. A little more generosity with their gorgeous ingredients wouldn’t go a miss, either. You’re looking at paying four pounds a pint from an adequate selection of traditional ales and lagers, and the same for the cheapest glass of wine. The wine list is brilliantly laid out with simple descriptions of the wine to enable a speedy choice – a section for the rich and elegant, another for the smooth and fruitful. A carafe option helps for those wanting more than a glass but less than a bottle. An absolute beauty for the winter afternoons is their hot Havana rum and cloudy apple juice at £4.90. 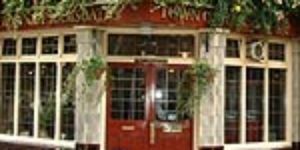 Is the Dartmouth Arms an upmarket eatery or a hideaway pub? It’s both. Comfortable and warm, with a well thought-out food and drink menu, you won’t be disappointed. 45 destinations curated by View .